The Huaqing Palace, situated on the northwest side of the Lishan Mountain south of Lintong County, is the site of one of the famous hot springs in Shaanxi. The Tangquan Palace was built there in 644, or the 18th year of the Zhenguan Reign of the Tang Dynasty. The palace was later renamed "Huaqing Palace". Every year Emperor Xuanzong would arrived to spend winter with his favorite concubine, Imperial Lady Young. Just as Bai Juyi wrote in his long poem Everlasting Regret, "She bathed in glassy water of the warm-fountain pool, which laved and smoothed her creamy skin when spring was cool." 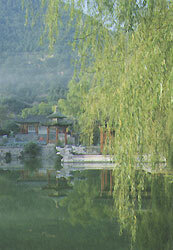 The "warm-fountain pool" refers exactly to the Huaqing Palace. Water temperature in the pool is 43 degrees Celsius, and the water contains a variety of rare elements conducive to human health. Major buildings in the palace include the Lotus Flower Pool, the Crabapple Flower Pool, the Longying Chamber. Rihua Gate, Yuehua Gate, Nine-Dragon Pool, Marble Boat, Feixia Tower, Imperial Lady Young's Pool, Chess Pavilion, and Wanhe Pavilion. There is something extremely tranquil about the scenery.